After his introduction to Timestream, Albert starts to get settled into the wonders of the afterlife on the Third Level. There’s a large, white house in the surrounding community that everyone’s familiar with. Anyone can go in and sit for a while, chatting with very friendly people from all eras of humanity on Earth. It’s a gathering place where people get together to learn about the rich diversity of human cultures. One fellow is a big, strong guy named Friting who wears a suit made from polar bear fur. He tells Albert he lived on Earth when everything was covered in ice, and when wind blew snow all over the land. Animals with long fur crossed the icy desert under a weak and pale sun. As an old man on Earth, Friting fell into a rocky ravine, broke both legs, and froze to death. He stresses the point that his people were not savages. They had their gods and their religion, and they painted their statues. Friting might have looked like this artist’s rendition of an Ice Age man. This sort of information seems unbelievable to Albert… but he says you pretty much have to believe all of the amazing stories and things that you hear and see on the Third Level. He also has a friendly chat with a Native American with a brown face, who doesn’t look at all like the Indians portrayed in Hollywood films. He wears an outfit made of feathers, a golden ring or crown around his head, and large gold earrings. He tells Albert his name is something that sounds like “Altualpa,” and that during lifetime the Spaniards made a real mess of his land. Albert says he has a hard time believing that the guy was really a king but, again, you just about have to believe everything here on the Third Level. 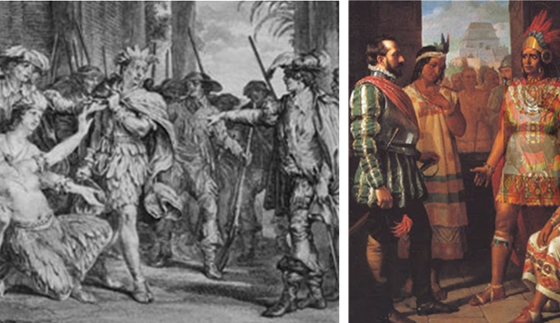 Early artworks depict Inca leader Atahualpa being tried and sentenced in 1533 by Spanish conquistadors, to the horror of attending tribeswomen… who kill themselves following the hanging of their beloved leader. The sketch on the left is probably a more accurate depiction of both the feathered clothing and the fevered passion of the moment. A death sentence seems inconceivable to the Inca people and their leader, who’ve been generous, accepting, and friendly toward the visiting Europeans. Unfortunately, the Spaniards at the time are still emerging from centuries of brutal injustice throughout Europe, starting with the Medieval Inquisition around 1200, and following up with witch trials of the late 1400s, and the Spanish Inquisition that is still raging well into the 1500s. Essentially, Atahualpa and the Inca people are victims of the violence that typically spins out of groups trying to coalesce under rigid values… be it Roman Catholic injustice toward pagans in Medieval Europe, Nazi injustice toward Jews last century, Mideast Islamic injustice toward women and infidels today, or fundamentalist, right-wing Christian injustice toward women, homosexuals, and the poor that is growing here in the States in recent years. It’s nice to know that the noble-savage dramas that get us lathered-up here on Earth can all be reviewed and put in perspective in the afterlife… during calm, friendly chats in a large, white house on the Third Level! I get a sense that ethereal beings have encouraged important people from throughout Earth history to reside in (or at least visit regularly) this “large, white house” on the Third Level, so that people at the end of a lifetime can come together here to get a better sense about their human heritage. Albert enjoys various expeditions with Sir Richard Francis Burton, the English explorer who has become a prominent member of Timestream since his death… and that will be the topic of the next installment. This entry was posted in Uncategorized and tagged Albert Fischbach, Atahualpa in the afterlife, big white house in the afterlife, friting, ice age man in the afterlife, inquisition, intolerance. Bookmark the permalink. Your site is the most interesting that I am privileged to receive. I have also had psychic experiences throughout my life.This is food for my Soul! I’m pleased that this information resonates with you. Mark, I feel the same way about your posts as Audrey does. They are a pleasure to read, full of mind-expanding information and thought, and even when dealing with the hard truths of humanity’s present condition, are full of hope. The great white house is intriguing. I wonder if the representatives of certain times and cultures found there might correspond to certain prejudices or assumptions held by the visitor, a sort of gentle prompt to further open one’s mind. Mark, I don’t know where I came across it, but I read recently in one of your posts about the entity called Pescator, one of whose incarnations was Jesus. For some reason, I cannot locate that post now, but I also came across the same information in your book. I have struggled over my lifetime to make sense of the Jesus character, and have finally made peace with Him, not as He is represented in religion but as a truly higher being. I wanted to say that I was powerfully moved by the brief comments about Pescator from different spirit communicators, and feel I now have a much deeper, infinitely more appreciative understanding of Jesus the man. In certain Spiritist communications received mostly through Chico Xavier, Jesus (or I think more likely, Pescator) is described as a being who from the very beginning has taken humanity and our Earth under His wing, and with the help of many higher spirits, has sought in many ways to guide us out of our ignorance and error and closer to the Godhead. This is the Jesus described also in the Cayce readings, a being who encompasses Jesus the man but is much, much more. My whole perspective on this Great Being and His love for Earth and all its creatures has taken a huge leap forward, and left me deeply humbled and moved. If you know of any other observations or communications about Pescator or Jesus the man, I hope you do share it. I feel that we understand so very little about who He really is, and how He helps us. (I can hardly believe that I’m writing this, when just a few years ago, I could hardly say the name Jesus without feeling very uncomfortable! ).